It's about time, so here goes... the PMGS StampFix app. Special thanks to my beta testers. There were significant changes between v1.0 and the current version (v1.08), and I couldn't have done it without your help. Please make sure you update to the current version. It takes this (left), and turns it into this (right). It'll do single images or batch processing. Windows 7+ and Mac OSX 10.10+. I suspect it might work on OSX 10.9, but I don't have confirmation. I'm working on a Linux version (sorry apastuszak ). It's designed to work with stamps scanned on a black background. I'm working in modifying it to do white backgrounds, but it's a bit trickier. This is the issue with which my beta testers had the most difficulty. I never realized how many people scan with a white background. Here's a tip -- Strathmore Chromolux Mirri Sheet, $2.99 for a 19 1//2" x 26" sheet at Hobby Lobby. Cut it to the same size as your scanner lid and attach it with Scotch Scrapbooking Tape. The latest version will always be available here. The page also has some basic instructions on how to use the app. If you charge people for software, they expect lots of customer support, and we cant have that! I do still have a day job. But seriously, I'll do my best to provide any support needed. I made the app to save myself a lot of time and effort. You folks get the benefit. Though I'm not charging for use of the app, there was significant cost involved in creating it, so if you feel like donating to the cause, there's a PayPal link on the download page. Despite the best efforts of me and my beta testers, there will, no doubt, still be some bugs. If something isn't working or isn't behaving like you think it should, please note (1) what you were trying to do, (2) what the incorrect/unexpected behavior was, and (3) and error messages it gives you. I have no doubt there will be some quick updates once everyone starts trying it out. I ask that you please be patient if there are new versions fairly often until I get the last of the bugs worked out. Also, if you have any suggestions for improvements, please let me know. Wow, my man. Great work! PostmasterGS, this is an excellent app. Thanks so much for sharing it with us. Thanks for all your work on this. As of about 10 am UK time today, unfortunately the link to the Mac dmg file is not working. Shoot. Sorry about that. Dangers of copy/paste. Try it now. This would be a great app. I run Windows 8.1 and the app does not do, what it is supposed to do. When I load an image, the app does not crop, align and so on the image. Left and right screen halves are the same. Also I do not get the bottom command line on my screen. Is this me or is it the app? Can you e-mail me a screenshot of what you're seeing? I'm at postmaster //---at---// germanstamps.net. 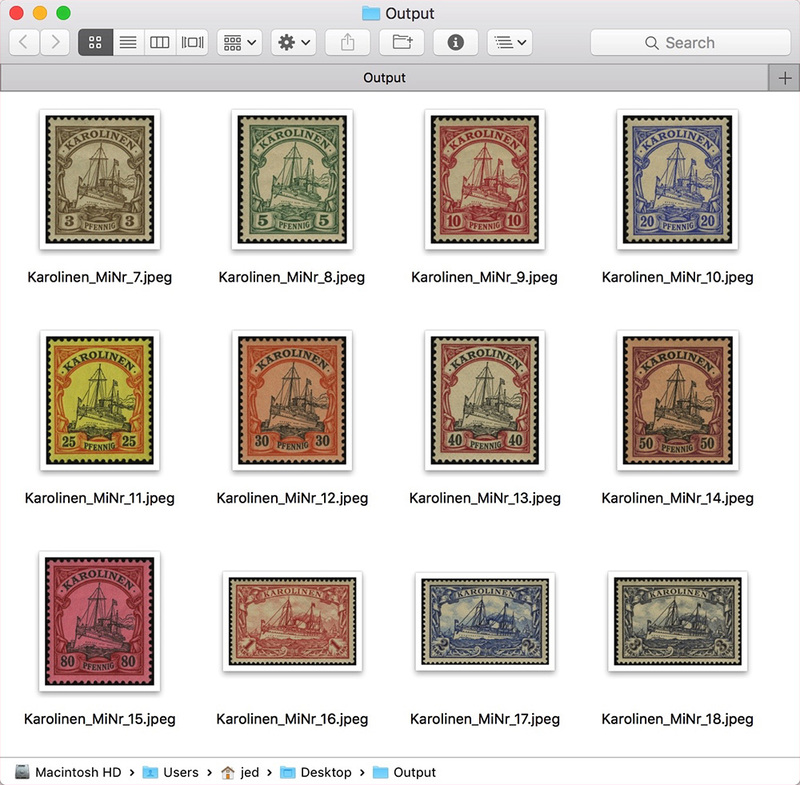 Any chance you can send me some of those diamond-shaped stamps on a black background? Both the square-ish ones and the not so square-ish? The two examples from the previous thread were perfect but I need them on a black background. I've just published the first update to the app, v1.09. It's available at the app webpage. The only change of note is a major correction to the cropping algorithm. With v1.08 if you applied a high manual rotation angle, the padding was off. 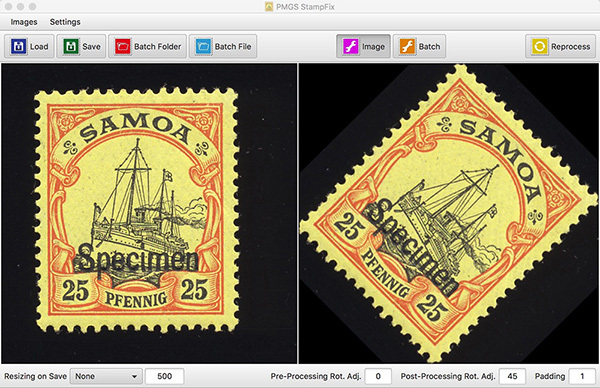 For example, observe the corners of this stamp -- the padding should be 1px. Here it is with v1.09. I took a new approach to the packaging of the app, and I managed to get the download size down from ~178MB to ~48MB. Also, there's now a lighter option -- if you already have Java Runtime Environment installed, you can download the app without the JRE bundled. It's ~9-13MB. So for those with a bandwidth cap, consider downloading the JRE directly from Java, so every time I update the app, you can just download the light version. I'm still working on dedicated diamond and triangle options. In the meantime, however, here are some instructions on how to process triangles and diamonds. The app still tries to treat triangles as squares, but you can overcome this by using only Pre-Processing Rotation Adjustments. If you find the sweet spot, it will make a perfectly cropped triangular stamp. The key is, DO NOT use ANY Post-Processing Rotation Adjustment. I haven't worked through that issue yet. It's also possible to do diamonds, though again, not yet on full automatic. For diamond stamps that are actually square, there's no amount of coding that will make the app treat them as a diamond. The app can't read the face of the stamp to tell which way is up in the text, so it will always rotate the stamp to a square. The solution -- apply a 45° Post-Processing Rotation Adjustment. For more traditional diamond-shaped stamps, the angle will be a little different -- in this example ~30° Post-Processing Rotation Adjustment produced this result. Hopefully, I'll be able to automate the triangles and diamonds soon, but until then, these tips will have to do! Another big update to the PMGS StampFix app. Now at v1.10. v1.09 introduced the ability to rotate/crop triangle stamps, but you couldn't use the final rotation adjustment or the image would be wildly off. This was due to the center of rotation being calculated incorrectly. 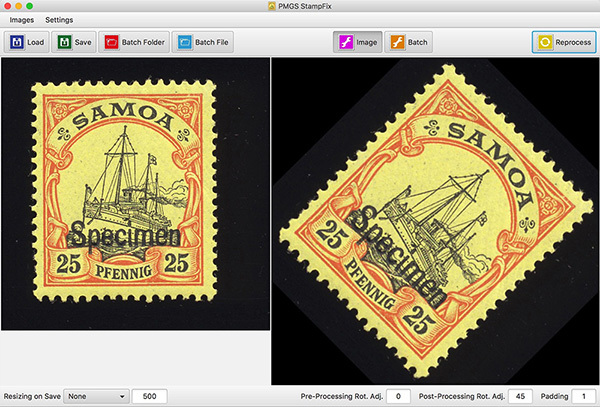 That's been fixed, so you can now manually rotate triangular stamps. The Big Addition -- White Backgrounds! This was, by far, the most requested feature that I hadn't been able to conquer. Well, it works now. It's complicated to get setup, but it works. 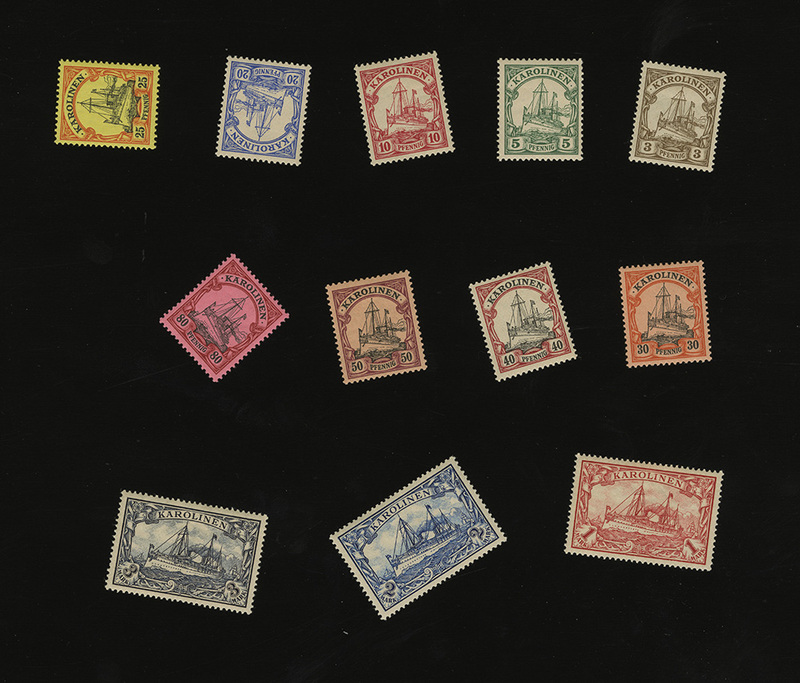 As does black stamps on black backgrounds. In very simplified terms -- when an image is processed, it's converted into grayscale. With grayscale, each pixel receives a value from 0 (black) to 255 (white). The threshold sets a number on that axis, and everything on one side is considered background, everything on the other is stamp. The difficulty in handling white-on-white or black-on-black is that the margin for that threshold is very small. 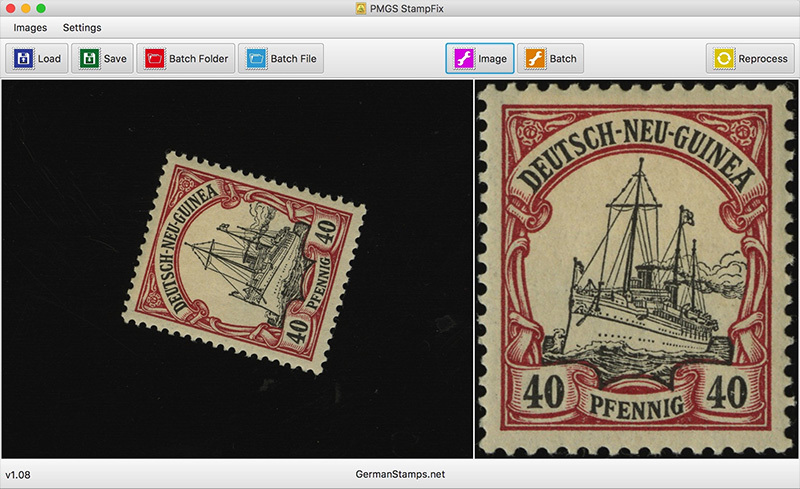 Sometimes, only 2-3 numbers on a 0-255 scale will allow the app to accurately separate the stamp from the background. And, the number will vary based on the shade of your background (in my example below, a white scanner lid was 240, a white piece of paper was 214). By allowing you to manually adjust these settings, you can find the sweet spot where it will produce accurate results for you. As usual, download is at the webpage. Assist on this one goes to MikeC99 . I am going to try your program. If I run into any problems I will let you know. I have now been using the Mac version on an El Capitan system for over a day - it really is a boon. Thank you so much, PostmasterGS ! And now, another major update! Meet v1.11. Download is here. 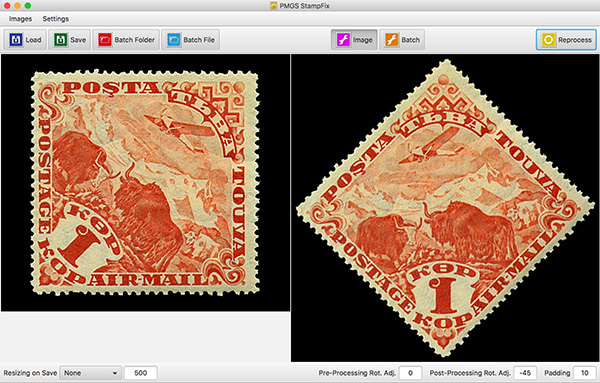 That's right -- extracting multiple stamps from a larger image, then rotating, cropping, and saving! It's pretty complicated compared to the previous steps, so once again, here's a demo. PostmasterGS , that is so great. I'll give it a try in a few days. Thank you for fixing the problem I was having. And the new options are so great I LOVE it. This looks fantastic, have to try this. If you have any questions or problems with the software, please let me know.